This post brought to you by Farm Rich Smokehouse BBQ . The content and opinions expressed below are that of Mom Fabulous. I am not a planner. 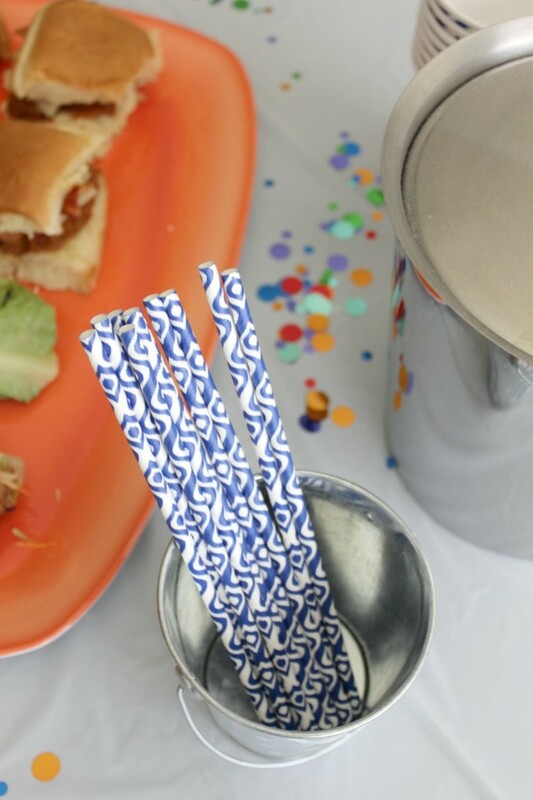 When it comes to having people over or throwing a party, I always seem to come up with the idea at the last minute. Let’s have people over tonight!…I say three hours before dinner. Just call me the queen of easy party ideas because that’s the way I roll these days. 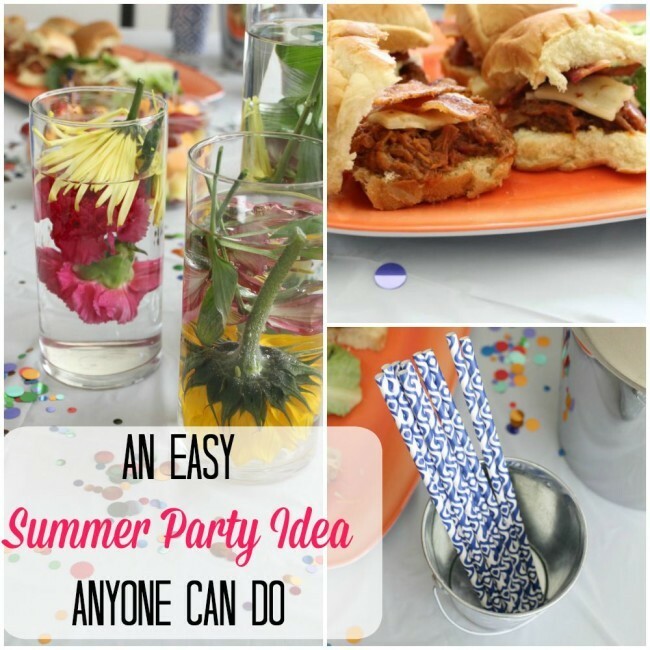 Here’s how to throw together an easy summer party in less than three hours, which is exactly what I did for this last minute get together with family. The Food It’s summer. It’s Texas. So that means we have BBQ of some sort. What do you do if a) you don’t have time to grill and/or b) it’s 130 degrees outside and your face would melt off if you tried to grill? 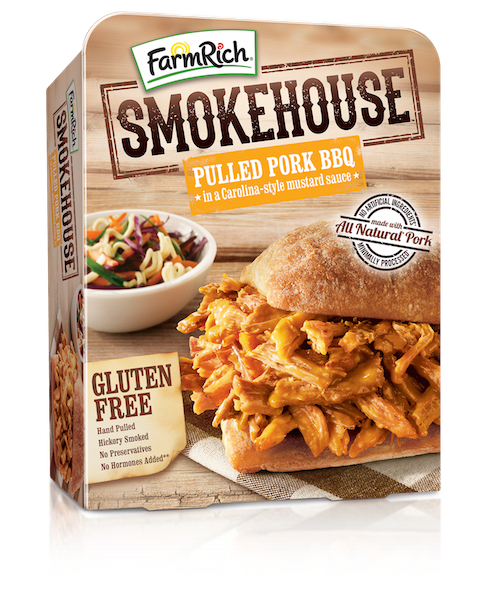 You head to the freezer section and purchase the new Farm Rich Smokehouse BBQ products. 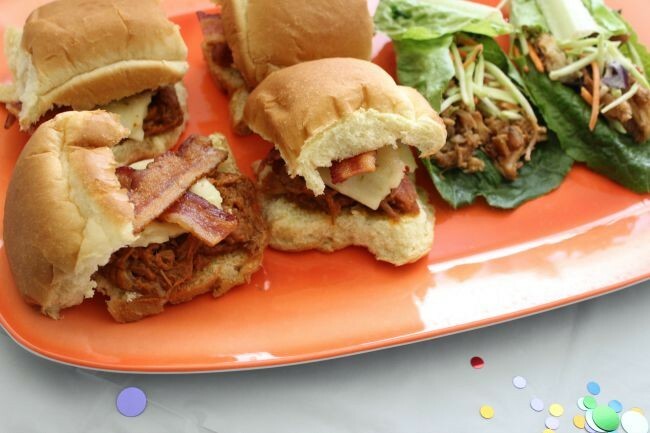 You can choose from: Pulled Beef Brisket, Pulled Pork BBQ, Pulled Chicken BBQ or Mustard Pork BBQ. For years I’ve been making grilled chicken sandwiches topped with pepper jack cheese and bacon. It’s one of my family’s favorite dinners and I can pull it together in no time. 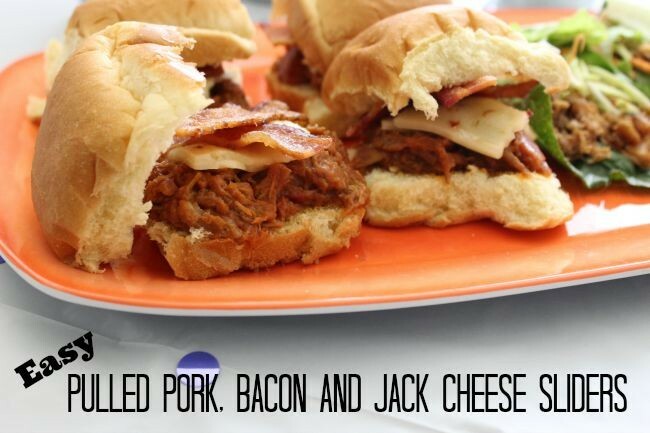 I decided to try it with pulled pork and it was just as delicious. You can Get a $1.00 off coupon now and try their new line of smokehouse meats for yourself. The Farm Rich Smokehouse products are authentic BBQ, that have been slow cooked for hours. Plus it’s all hand pulled, simple, and made with clean ingredients in America. You can prepare the meat in the oven or microwave, depending on preference and how much time you have. I also made some lettuce wraps with the Pulled Chicken, broccoli slaw and a dash of BBQ sauce. They turned out very tasty. 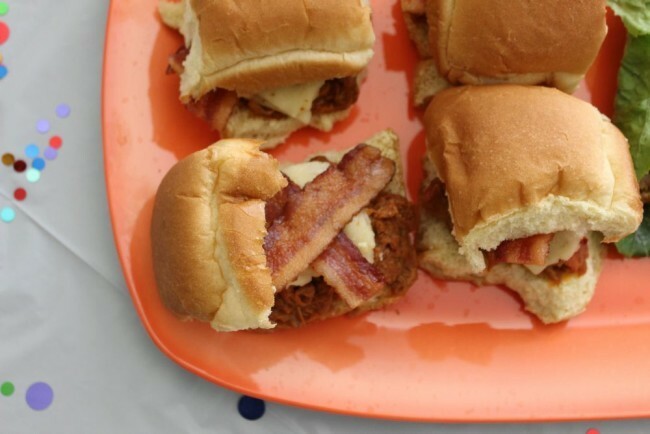 Both the sandwiches and wraps were fast and easy to prepare, not to mention yummy! 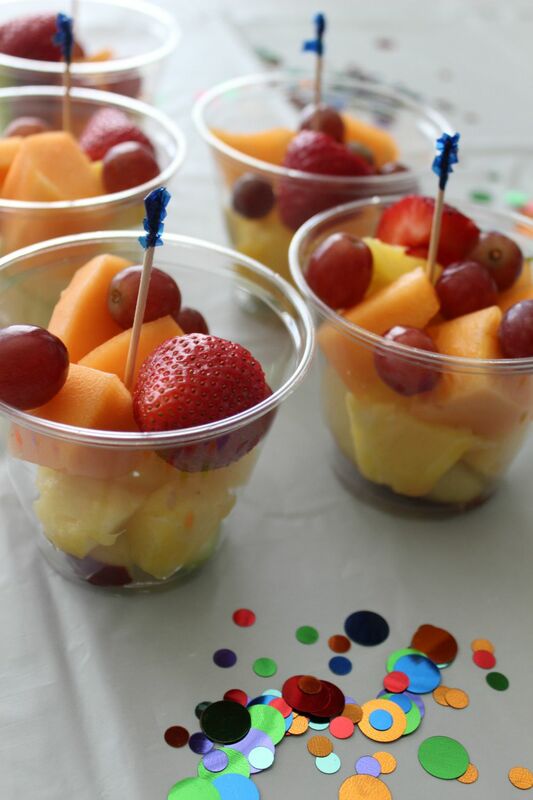 For the rest of the party food, I put pre-cut fruit in plastic cups with a toothpick for easy eating, and threw some chips and salsa in a bowls. Easy peasy. I also had lemonade in a pitcher and ice available for scooping in an ice bucket. The Decor The decor was as simple as simple gets. 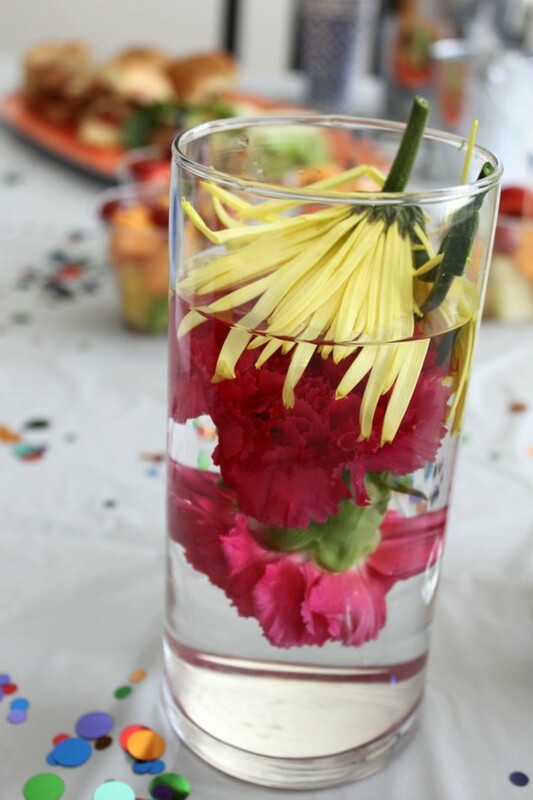 I put a white table cloth over the table, sprinkled some confetti all around and submerged fresh cut flowers into vases of water. The flowers and confetti added some beautiful color. 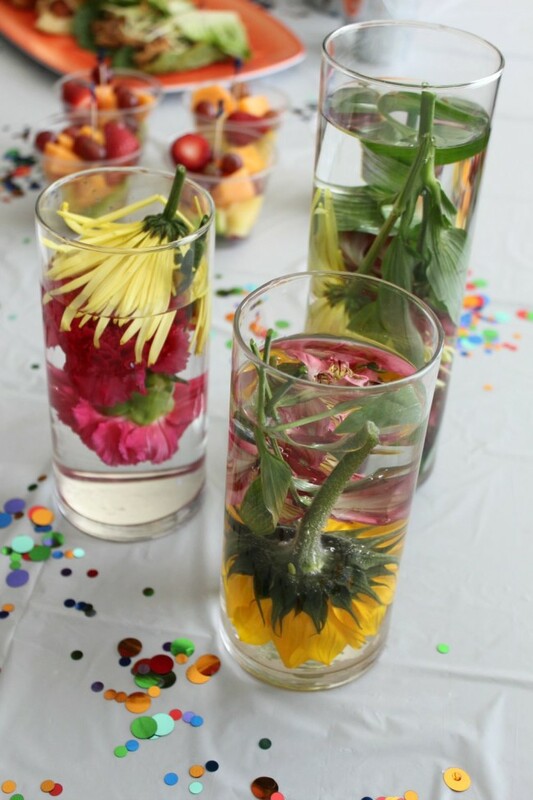 The flowers were also a hot topic of conversation…are those real flowers upside down in water? Why yes, yes they are. I love the way they look and the colors scream summer. 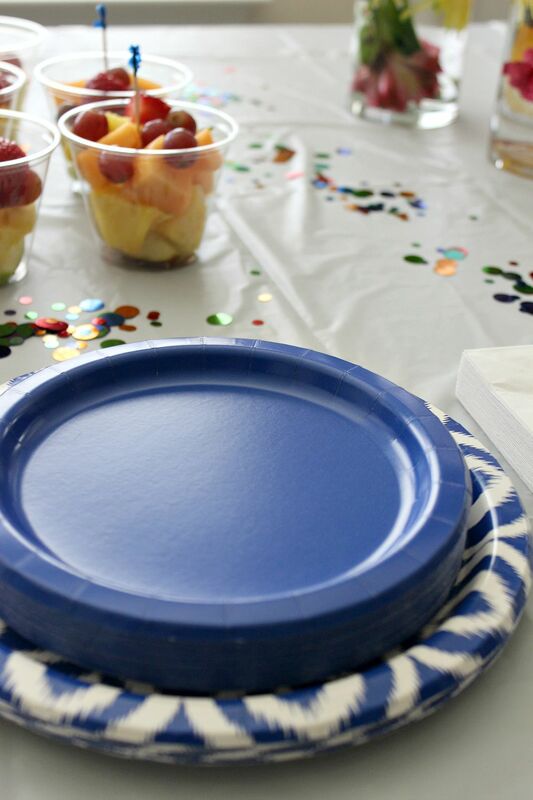 I purchased some coordinating plates, straws, cups and napkins in a gorgeous blue. This party was a color explosion, which made this color loving lady very happy. For years I would spend hours and hours getting ready for a party or to just have people over for dinner. While there’s definitely nothing wrong with that (and I still throw parties that take quite a bit of prep), before the guests even arrived I was a ball of stress and a total mess. 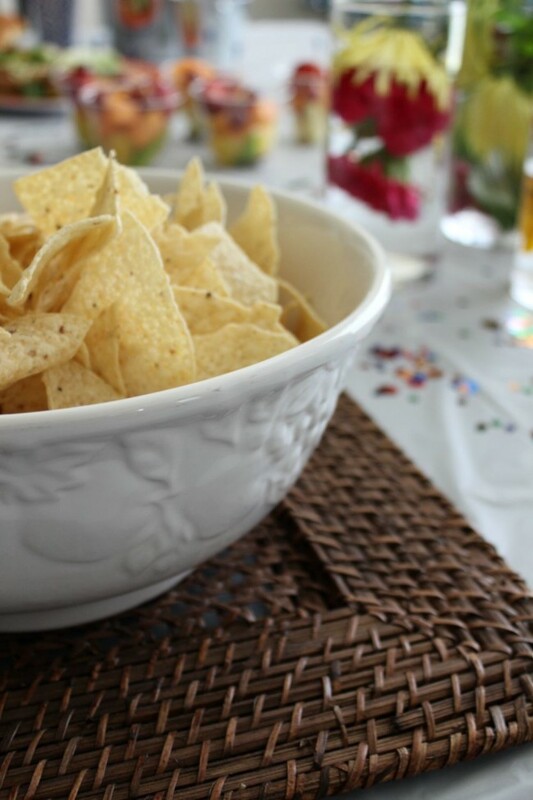 Was I able to enjoy the party and the people I invited into my home? Nope. Not at all. And I’m sure they noticed and probably felt a little unwelcome. I’ve learned that by utilizing some easy party ideas like the ones above, I enjoy the party so much more and I’m sure my guests do as well. 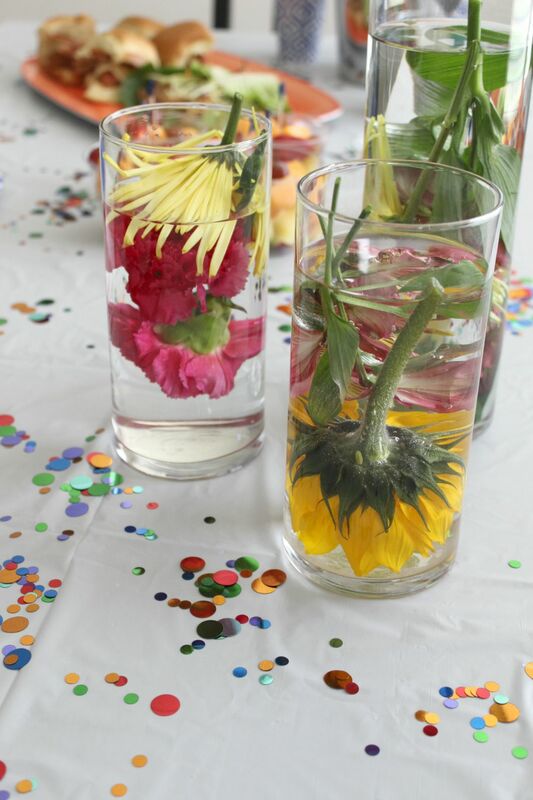 Do you have any tips for throwing an easy party? Please share! Previous articleBack to School Beauty Favorites, Plus a $100 Target Gift Card Giveaway!